Wisdom of Life. : Suggest, don't criticise! 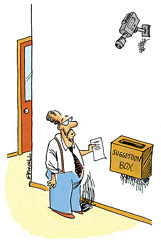 Suggestion is better than criticise. Suggestion has understanding,whereas criticise creates anger. When I was much younger, I tend to criticise and I did not gain support then. With a little wisdom of today, I tried to suggest more in life and I tend to gather more strength. Those days, when a good friend turned up late, I would criticise his bad punctuality. Instead the criticism led to anger and quarrel. Today if a friend is late, I try to be patience and give him the benefit of doubt. I prefer to suggest a better way to ask, "I am sure your late could be due to some unforeseen matters. Perhaps call us the next time, if you can't make it in time. Will you?" No friend will be angry with that approach. Last time, I would criticise my sons for being not responsible in any undertakings. I felt sad eventually because the criticism turned frustration between us. My children might not talk to me for days later. With a little wisdom of today, I have changed to suggesting instead of criticising. With a bit of humour I would say, "Son, as you are a brilliant boy who has a caring heart, I am sure if you put all your effort into this assignment, you will be able to complete it. Right?" The job was done in perfect condition. I am writing my blog now when my little darling has gone to bed without waiting for me. In fact earlier we were thinking to have intimacy tonight. Now she has slept while I am alone. Shall I criticise her tomorrow and tell her on the face. If I do it, I know she will be annoyed and I might not have her for the next one week together. The better way is suggestion. I would smile and say, "Darling, I know you were tired last nite and slept earlier. How I wish you were waiting for me while I blog. With you around me, don't you think I can write better. Coz your intimate love can excite me, dear!" Don't you think, it sounds better? Oprah Winfrey - "Turn your wounds into wisdom."